Canon Andrew White is your Connector of the Day.. There aren’t many Anglican vicars who wear bullet-proof vests. Canon Andrew White is one of them. 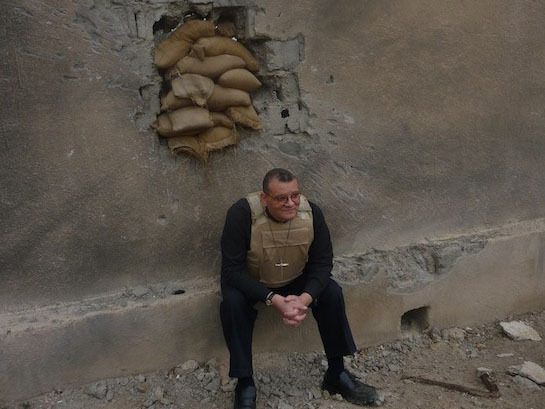 Known as the "vicar of Baghdad", he works at Saint George’s - the only Anglican Church in Iraq. In the past, the building and the clinic next door has come under attack. But despite the tough working conditions, Canon White says there's nowhere he'd rather be. White, who suffers from multiple sclerosis, is also the chief executive of the foundation for relief and reconciliation in the Middle East –an organization which aims to bring together political and religious leaders in the region. Recently, he brought a group of Iraqi children back to the UK with him for a holiday. A man who many admire, Canon Andrew White is dedicated to uniting people of different faiths. Want to know how he feels about the current situation in Iraq or about his life living in Baghdad? Here's your chance to quiz Andrew White. Leave your questions below and be sure to include where you're writing from. Canon White doubtlessly believes that he is doing 'God's work' in Iraq, and that's probably true – in both the positive sense (meaning humanistic good) that even an ardent atheist like myself would ascribe to the term and in the negative sense that an ardent atheist such as myself would understandably ascribe to the term. Religion is an outdated and irrelevant system; perhaps exposure to non-crazy, good-work doing Western religious types is the methadone that certain fanatics need to see to moderate their views of the west, but one can't help but also remember that, save for having an evil dictator at the helm for many years, Iraq worked quite well as a civil, secular society While I'm sure for a religious man like Canon White the two are likely inseperable, one can't help but wonder whether good works without the baggage of an irrational religion (be it Christianity or otherwise) would be yet the greater good. That said, whatever my philosophical stance, I applaud Canon White for what appears to be good work; I sure hope that a profession of faith or inclusion in a church was not a requirement for a holiday in the UK for any child. What is your opinion on the way Jalal Talabani, the current President of Iraq, is Improving the Unity between Muslims and Christians living in Iraq in order to establish Iraq’s motto: "God is (the) Greatest"( Arabic: الله أكبر)? Why of all the churches to set up shop in Iraq why Anglican, with its deep seeded roots in the history of the Crusades? I guess if the Iraqi and Muslim people can accept that particular version of Christianity, they will accept any and all Christianity. My question, why do you wear a vest? Is your faith in God that dubious? When I was there I didn’t see a single Mullah wearing one, their faith in Ala was unwavering. What is your view about the pullouts of the military currently taking place? Do you feel that Iraq is not only ready 'to take the reins" but to continue to grow and stabilize(sp) as a country? Your church in Baghdad is interdenominational. Is this a model we'll see many more churches adopt in the future? Does the constant threat of violence ever make you question your faith? What has inspired you the most during your time in Iraq? Our church is Anglican in name but their are very few Anglicans. The church has bee there over 140 years. My chairman Lord Hylton said when he came it was the church of the future. Denominations do not matter. We love all not even just the Christians. We have a very large clinic 95% of our patients are Muslims Non are charged. I only wear a bulet proof vest when my security make me. Now they are all Iraqi it is not very often. The threat to me is very high I cannot walk down any road. The widrawal of the US is worrying to most Christians. A major part of my work has noting to do with church but religious sectarianism and corruption. I work with religious leaders of all faiths not just Christians but mainly Shia and Sunni Christians. Religion has been the cause of many problems in the world. when religion goes wrong it goes very wrong as W Temple said. I'd like to know - how would you achieve religious unity when you're in a part of the world that seems pre-disposed to remain mortal enemies? How do you change a mentality that seems to be as old as time & passed on through generations? You change people by geting them to spend time with each other and to hear each others stories. It is very difficult. As Longfellow once said. "who is my enemy, It is the person whose story I have not heard". These people know about the other but have not met the other.This always works it is not quick it takes at least two years. When the US withdraws, who will likely advance? As a Christian Catholic born in Iraq, I should know the mentality of the Iraqi people. Although Christians are the minority but history shows they are the original people of Mesopotamia. Although Islam's holy book is full of long prayers with reference to Jesus, Mary, Joseph and , AbrahamI, there has always been great and utter resentment even hatred towads the Iraqi Christians. This has been evident for the last 55 years ( I am now 68 years). Most of the Iraqi Moslem majority simply contradict their Religion. This resentment can never be wiped out at. As far as the work being done by Cannon White, I can simply say 'he is a saint ', putting his own life on the line, being away from his own family and all for GOD work, he simply deserves to be called a saint. I admire you, Canon White, for what you are doing for the Iraqi people. May God protect you as you do His work. May He bring peace to this troubled region. The way to change things is so often through the children, whose minds are more open to new approaches. first – how easy is it for you to have these conversations with children and teenagers – and if so, do you find they can respond openly? Or are you 'limited' to speaking *only* to the adults in different parts of society? second – is there any prospect of the kind of 'Peace and Reconciliation' process which Archbishop Desmond Tutu took part in, in Northern Ireland [televised, showing the extraordinary response of those who had never wished to encounter one another before]. Would "The Elders" [the group which Nelson Mandela/Desmond Tutu and others have set up] be willing to be involved?? Andy and I love and miss you. We wish we could be there with you like before. And to all those who have submitted their questions to Father Andrew, God Bless you all. Father Andrew is the most honorable man that my husband and I have ever met and will ever meet for as long as we live. I remember Canon White from my days at St Mark's Battersea Rise. I also remember his lovely wife Carolyn. I remember his warm and cheerful personality and how beautifully he conducted Genny and Tim's wedding. I admire what you are doing in Baghdad so much and the sacrifices you make especially being separated from you family. I now live near Durham city but if ever you are up this way; I would love to hear you speak. There are many amazing people in this world. Many, who when put into a situation, do amazing, honorable, and heroic deeds. Then, there are those that sacrifice themselves and commit their life to serving others and changing the world; truly amazing, truly honorable, and truly heroic. Thank you from San Diego, CA, USA. God Bless you, your family, and your staff. My family met Father Andrew during one of his visits to the United States. He is a remarkable man doing Gods work in the most dangerous of places. I suggest reading his book The Vicar Of Baghdad. I pray for his safety and for the children he is helping. Thank you all for the comments. Firstly the Christian history in Iraq is simply amazing. I have written about it a lot in my book "The Vicar of Baghdad". They have been Christians since the beginning when Mar Thoma stoped of in Niniveh on his way to India. In the west he is simply called doubting Thomas but for us he is the one who brought the good news to the people Jonah took the the news of the God of Abraham, Isaac and Jacob. The two of them are reverd and Niniveh is still Christian, all of my people are from there. Now Children! They are the only means by which I survive and the most important aspect of my work there. I love them and they love me. My latest book just written is called "suffer the Children". It is all about the amazing role of Children and my links with them. May God grant Father Andrew the strength and grace to carry out his ministry. The way to heaven is through the narrow gate (Luke 13: 22-30) and that is what Father Andrew has chosen. The saddest thing about the correspondence I have just read is the remark from the ardent atheist James. Jesus loves him and died for him despite what James says, and yet James does not accept that. But faith is a gift from God so I pray that James will study the life of Jesus and the Bible and come to know that Jesus is his personal Saviour. The Power of prayer is awesome. Please God that love will overcome the hate that exists in so many hearts today. God bless you Father Andrew and all who do such selfless work. Amen. Who would want to leave their comfortable home, their children, their wife, their job, their safety and their sanity to go to Iraq? I'll tell you who. Canon Andrew White! A man of God, called by the Holy Spirit to not only talk about change, but to sacrifice everything to make an eternal impact. When I read his books, when I hear his stories and when I listen to his sermons, my heart cries out for my people and my beloved Iraq. I have never known any other who loves the Iraqi's as much as Andrew, besides Jesus himself. Only when God speaks to your heart can you lay yourself down for others, as he has laid his life down for the Iraqi people. While a large multitutude of Iraqi's have escaped Iraq for fear of their lives, Canon White chooses to remain in Iraq under constant threats. We all have a lot to learn from this wonderful man of God. I am so encouraged by your work in Iraq. The gospel is being spread, and not only that those that hear are learning to have a relationship with the Lord. To some this is foolish talk, but not to Jesus. He knows what and why and everything else not only about your ministry there, but in all hearts everywhere. God bless your work. Keep wearing the vest it is just common sense. So glad we are free in Him. Question: When will we see you at the River in Tamp again? My husband and I had the great privilege of hearing Canon Andrew White speak last year in the USA and I was so moved and amazed at this man's message. God has truly raised him up for such a time as this, and thank God, he is following and obedient to this great work. God Bless you, protect you and continue to use you in His service to those wonderful people in Iraq. As an Iraq living in Baghdad and experiencing the danger of daily life, I would like to thank you for trying to help the people who got tired from the killings and violence, but I have question, since you have been in Iraq and talking to people, do you really believe that violence in Iraq is based on religious or sectarian reasons? cause I lived in Iraq before and after war, Iraq was always a secular country, and we have not think about the differences of religions, all Iraqis were living together as one family. and the killings that's happening are all for politics aims. Perhaps does conflict and war urge clergy to step beyond the boundaries of denomination in a much more intense way than ordinary day to day life demand from people who's Spiritual Message must transcend all Religion or wither away as unfulfilling empty ritual having come from people seeking power over others. I wonder how Spiritual leadership in Combat zone can overcome the sanctimoneous empty belief many churchleaders have poured over humanity whilst claiming to have been chosen to the task as a Man from God. When religion goes wrong it goes very wrong and it has here I fear. under Saddam religion was kept down with so much else. I was here before the war and the religious leaders told me the terrible things they went through. They would only tell me when out of Iraq. It was simply awful so it is now in a different way. As regards denominationalism it still exists here amongst some of the Church leaders. Amongst the people it has no place I have four thousand people but only four are Anglicans. To the masses of Christians denominations mean nothing. They mean nothing to me. All that matters is that we love Jesus. Here amongst the tragedy you have the church of the future. we look to him not politicians or diplomats. I wonder if CNN will put up Andrew's Connect interview as a video like the other Connect interviews. I do hope so. CNN, You, we and the rest of the world need to hear from Canon White. I know, because I have. Get to know him. Get to know people who are not like yourself is taking peace by the hand. It always works and indeed is all that ever has. God knows and helps. My sister who is a missionary in Japan sent me a copy of your book, The Vicar of Baghdad, for my birthday. It was a revelation to learn about the amazing efforts being made among leaders of many faiths to bring reconciliation to the Middle East. May God continue to bless and sustain you all as you lead in this endeavor. I believe that all of Andrew's work is motivated by love. Love for the Creator of all men–his God, and love for God's creation–mankind. Andrew shows love through his good deeds to all men whether they know their Creator or not. Jesus said if you love only those who love you how are you better than unbelievers? But I say, 'Love your enemies and pray for those who persecute you." Love keeps no record of wrong, and covers over a multitude of sins. These attributes are critical to establishing peace.